A recent study compared opioid agonist treatment (OAT) and detoxification in patients with opioid use disorders. 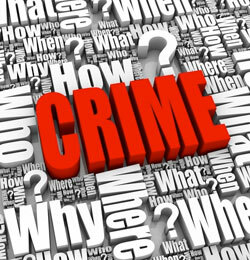 The goal was to see which treatment approach is associated with costs of crime. A team of six investigators, supported by a grant from the National Institute on Drug Abuse (NIDA), led the study. They published their findings last December in the online version of Addiction. Included were more than 31,650 patients. Treatment took place in publicly funded facilities in California from the beginning of 2006 to the end of 2010. The median treatment time was 130 days; median observation time was 2.3 years. Justice system costs included policing, court, and corrections. Costs related to victimization included crime-specific medical expenses, cash losses, property theft or damage, and earnings lost due to injury, etc. The team was especially interested in the difference in crime costs during and after OAT, a time-unlimited (maintenance) treatment. Costs were compiled in 2014 US dollars; see the full report for details. Medications. Treatment in publicly funded programs “predominantly entailed” offering patients methadone, rather than buprenorphine, buprenorphine/ naloxone, or naltrexone. Costs. Average daily costs of crime per person, over an assumed 1-year period—including treatment and post-treatment categories—were $113. 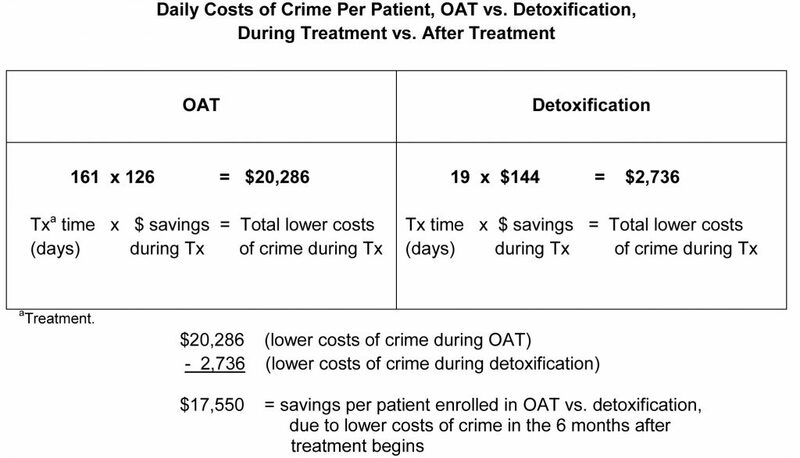 When investigators compared the costs of crime per patient during treatment, they found daily costs were $126 lower than after treatment for the group receiving OAT, and $144 lower than after treatment for those undergoing detoxification. But the picture changed when they included length of treatment time—161 days for the OAT group, much longer than the 19 days for the detoxification group. The table below shows how that figure was calculated. Birnbaum HG, White AG. Schiller M, Waldman T, Cleveland JM, Roland CL. Societal Costs of Prescription Opioid Abuse, Dependence, and Misuse in the United States. [Epub March 10, 2011]. Pain Med. 2011; Apr;12(4):657-667. PMID:21392250. doi: 10.1111/j.1526-4637.2011.01075.x. Florence CS, Zhou C, Luo F, Xu L. The economic burden of prescription opioid overdose, abuse, and dependence in the United States, 2013. Med Care. 2016; Oct;54(10):901-906. PMID: 27623005. doi: 10.1097/MLR.0000000000000625. Krebs E, Urada D, Evans E, Huang D, Hser Y, Nosyk B. The costs of crime during and after publicly funded treatment for opioid use disorders: a population-level study for the state of California. [Epub ahead of print December 15, 2016.] Addiction. doi: 10.1111/add.13729. For related articles, read Virginians Vote: Support Treatment—Not Jail—For Drug Users* and Fighting Stigma: Down With “Drug Users”; Up With . . ?